An autonomically operated semi vertical Pluton F&V presents products in an especially attractive way and is a perfect choice for fruit and vegetables in your store. The optimal thermal conditions at all points of the refrigerator ensure maximum freshness. Pluton F&V features easy access for cleaning and service, mobility, a light structure and is pleasant to the eye, yet sturdy. Its external lighting perfectly enhances the display of goods. The move away from higher GWP refrigerants is gathering pace, and in the light of F-gas phase down, propane is a reliable and accessible natural alternative to F-gas refrigerants. Katalogové č.: Jupiter vision The elegant and open ergonomic design of the Jupiter Vision provides perfect visibility, making products on display the main priority of visual impact. Its compact canopy lighting, panoramic sidewalls and cascade shelving (optional) guarantee perfect visibility from every angle. 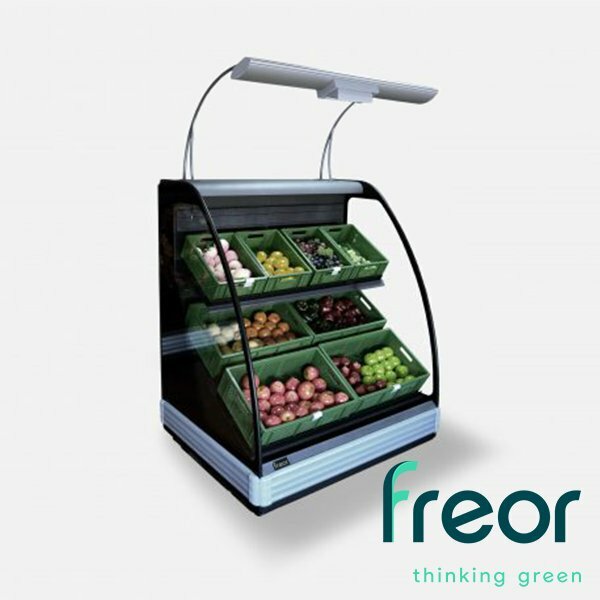 Optional specific construction of shelves with boxes provides the best way to display fruits and vegetables in a vertical approach. Jupiter Vision features wide-open display area and is also suitable for the preservation and display of dairy products, prepacked meat and delicacies.